So it turns out Lavish Alice make the most perfect summer dresses ever, I remember the first time I saw this dress it was March last year and I was in love I then had to wait until June to get it and by then luckily for me it was £15 in the sale! Sadly I've only worn it twice but I plan on bringing it out of my wardrobe loads more this year probably because I bought new shoes that go perfectly with them but you know. I decided that I'd try and make this outfit post a little quirky and more fun in the end I found these photos fairly hilarious cause I look pretty special and I was trying for somewhat cute and quirky but hey ho I still like them and thought I'd share them! 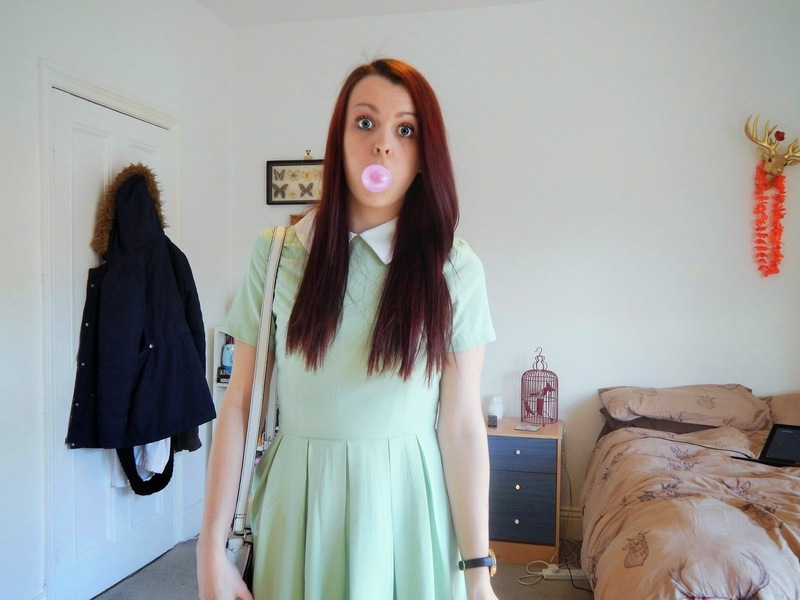 ^This is my favourite photo out of the set, it took me forever to be able to actually blow a bubble, that's why I look fairly shocked ahah. Seriously though this dress is a dream, it's so comfy and the material is perfect for the summer. Mint green and white are two of my favourite colours for the warm weather, frilly socks are also my favourite for warmer weather they look so much cuter than normal or trainer socks do. The bag is from TopShop a couple of years ago and its my favourite thing ever. The shoes are brand new and I wore them out before even considering wearing them in and they were so comfy, super bouncy and I never want to wear anything else! Where do you get your summer dresses? What's your opinion on trying to be more quirky in outfit photos? Title is song lyrics from Paramore's Still into you which is one of the happiest song ever I think.